Former New York City Mayor Michael Bloomberg was so adamant about the effect of soda consumption on the health of New Yorkers that he tried tirelessly but unsuccessfully to impose a soda tax in New York much to the dismay of many New Yorkers. Now he seems adamant to spend more of his own money having just launched a $3 million television advertising blitz in the Chicago area using his own personal money in support of the "Cook County sweetened beverage tax." His aim, the same as his aim in New York, is to reduce the effect of soda consumption on children and teens in working class backgrounds particularly since it is a known fact that 40 percent of them will develop type-2 diabetes in their lifetime. Now he is trying to do the same in Cooke County, Illinois. This looks like it might be more than possible asBerkeley, California was the first community in the United States that passed a targeted tax on soda in 2014. As the summer comes to an end, sports drink manufacturers will be high-fiving after another record breaking years of sales for sugar-based sports drinks. However, many dentists are seeing the effects of dental caries mostly among young men and women under the age of 30 who are the prime target for consumption. PepisCos Gatorade brand has become the undisputed leader in these sugar-based sports drinks that are prevalent in the U.S. market. A recent report by Euromonitor International shows that Gatorade captured a 77 percent market share of the $6.8 billion industry in 2014, according to the Wall Street Journal. As the carbonated drink industry becomes more aware of peoples aversion to aspartame, they have been making significant inroads into the sports drink and fruit juice industry with Coca-Cola acquiring a 30 percent stake in Suja Juice - a manufacturer of California-based organic juices that uses HPP technology. Suja Juice generated $42 million in revenue in 2014. However, dentists are quick to point out that these organic juices have sometimes just as high sugar content as sports drink and the effect can be seen in the dental chair increasingly. Between 1989 and 2008 the average consumption of sugar-based beverages increased by 60 percent in the age group six to 11. The percentage of children consuming them grew 79 percent to 91 percent during that time period. The production in the U.S. for sugar-based soda pop is staggering. The beverage industry produces 10.4 billion gallons of soda pop each year. This is enough to serve every American a 12 ounce can every day for a whole year. Dr. David Pinkhsaovspends a lot of his time preaching common sense guidelines to children and their parents at his practiceRight Family Dental P.C. in the Bronx. He uses hard facts to break it down to children and parents where they see that soda consumption is a problem. I tell my patients how much sugar they are consuming when they drink sodas and most are very alarmed, saysDr. Pinkhasov. When you drink a can of soda you are consuming 150 calories, 90 percent of this being derived from high fructose corn syrup. Lets forget about the obesity problem in New York for a minute, the damage that can happen to your teeth over time is huge. Once you consume one of these drinks the sugar entering your mouth combines with the bacteria present - this is when acids are created that attack your teeth. This period lasts for about 20 minutes with the end result after over consumption being that there is enamel erosion and your teeth and are then very vulnerable. His partner, Violeta Skevas, DDS, says she sees no change in the trend and points to recent industry figures such as the 2013 study which showed that manufacturers of soft drinks spent a staggering $866 million dollars in advertising across all types of media. This is a huge amount of money, but more worrying than this is the effect that this can have on our economy - we spend nearly $200 billion in the U.S. treating the obesity epidemic. It has a trickle down effect for all us - higher taxes, higher health insurance, everything. We see a lot of patients coming in with an emergency toothache or root canals and many have failed root canals, so there is really no option other than extraction or dental implants. In many of these patients we see that there is over consumption of sports and sugar-based drinks that patients use for hydration in the New York heat. In my opinion the overconsumption of sports drinks can contribute greatly to dental caries. 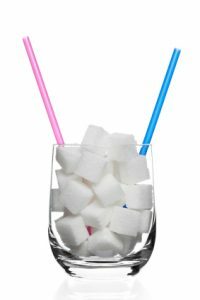 The overconsumption of sugar-based drinks seems to be the same all over New York.Jim Sarji, DDSofAdvanced Gentle Dentistry of Park Slope,says he sees patients, many of whom are very athletic but now realize that overconsumption of sugar-based sports drinks has had a debilitating effect on their teeth and are now looking to remedy it. For some people it is not unusual for them to drink one of these sports drinks a day, sometimes more on a hot day. This is a lot of sugar. David Pinkhasov, DDSsays that the effects of sugar consumption in the Bronx has undoubtedly led to the high incidence of type-2 diabetes which he bases on the medical evidence he has read and the effects of which he sees every day. There is a large incidence of periodontal disease in the Bronx. This is largely due to the high incidence of type-2 diabetes. If you have type-2 diabetes then you are more prone to periodontal disease and if you have periodontal disease this can exacerbate your diabetes. It is a vicious circle. He is quick to point out a recent Epi Data Brief published by the New York Department of Health and Mental Hygiene in 2015 which stated that 47 percent of adults ages 30 and older in New York City have periodontitis (gum disease) and that 26 percent of these adults in the age range 20 to 64 have untreated caries (cavities) which can lead to tooth loss, pain, infection and trouble eating and speaking. Dr. Steven CisternasofRichmond Hill Dental Design StudioandBay Dentalsees a similar situation at his Staten Island practice. The over-consumption of these drinks can be seen daily when I step out of my office and walk down the street. Everybody is drinking sports drinks, especially the younger generation and especially in the heat.He offers some advice for those unwilling to give up sports drinks to reduce the harmful effects: Always use a straw to minimize contact with your teeth, limit your consumption to below 12 ounces a day, never consume before going to bed, and always drink water after consumption only brushing one hour afterwards due to the fact that your enamel will be temporarily weakened. Dr. Arkadiy Takhalov of Dr. Ts Pediatricshas a completely different philosophy. We start educating parents when they first come into their office with their newborns. We point out the amount of sugar in these drinks and that even apple juice has a huge amount of sugar for a young child. This can damage the first set of teeth and the second set of teeth. Milk is a better option and is more nutritious. The American Academy of Pediatrics warns that children drinking a lot of juice, even just an eight-ounce sugar sweetened drink can increase a childs odds that they will become obese by 60 percent. Education of young mothers is the key.